Molly 47's Story . . .
Molly is a sweet girl who was spending too much time alone in her Ohio home. She lived with her family for 5 years and was bought for the teenage children who are now in their 20’s and out of the house. Recently her owners' job situations changed such that they were gone for 12 to 13 hours per day. Molly was left alone in the house during that time and never had an accident. Her family decided that Molly should be rehomed with MAESSR so that she will get the love and attention she needs. Her foster mom thinks Molly is the poster child for Springer foster dogs since she is so perfect! She is a gentle girl who gets along with all people-- even the fourteen month old grandchild in her original home. In her previous home, Molly lived with a cat and they got along well. 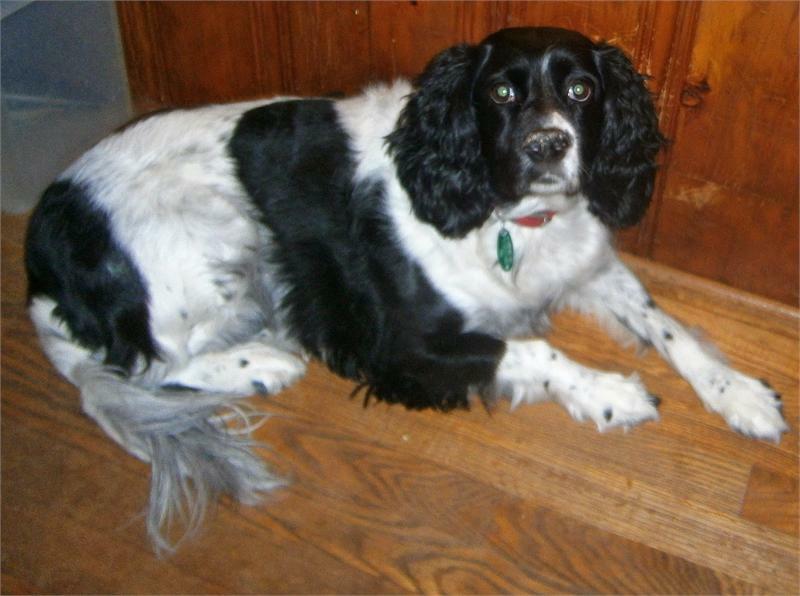 She is good with other dogs that she meets on walks and with the resident Springers in her foster home. With impeccable house manners, Molly is housetrained and crate trained. She is given full freedom throughout the house since she is so well-behaved. She barks to alert her people that someone has come to the door and she doesn't dig, chew inappropriately, or counter-surf. Her only behavioral misdemeanors are that she begs for food and will jump on people in greeting. Molly hasn't had any formal obedience training and knows "sit." She will pull on the leash and can't be totally trusted off leash. She'll eventually come back when she's finished investigating whatever interesting thing that has her attention. Molly rides well in the car but has only been to the groomer and vet. She doesn't get carsick. During playtime, Molly loves to chase balls but is not interested in squeaky toys. She is also not interested in the water for swimming. She’s a low activity girl and enjoys hanging out in the house with her people. Molly is a very loving girl and is pretty much the perfect dog. Some lucky family is going to be very blessed to have her join their ranks.